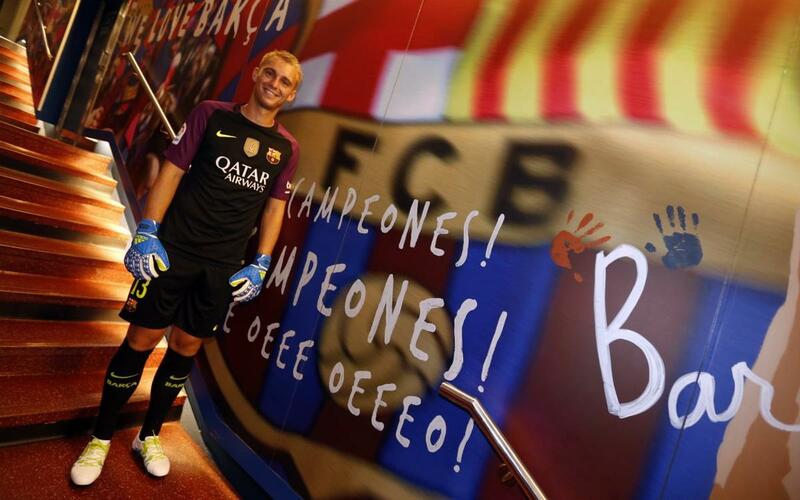 Having signed with FC Barcelona and having already taken part in his first training session, new goalkeeper JasperCillessen was at Camp Nou on Friday to see the Stadium for the first time before his official unveiling to the fans. "I am delighted to be here and very proud to be at Barça," he said. "I hope we can win a lot of trophies together. For me, living in Barcelona is a dream." The Dutch goalkeeper knows how competitive it is for playing time but said he would try and make the coach's decision a tough one, while at the same time praising new teammate and fellow goalkeeper Marc-André ter Stegen. "He is a good goalkeeper with a lot of talent," Cillessen said. Cillessen trained with the squad earlier in the morning and had the chance to meet his new teammates. Cillessen also talked about the links between Ajax, his former club, and Barça. "It is very special and it motivates me to be at the same Club JohanCruyff was a few years ago." "It is a pleasure to bring in Cillessen. We also want to also thank goalkeeper Claudio Bravo for his professionalism and commitment in helping us win titles. I wish him all the best. After the Champions League draw, however, we wish him less luck when playing against us." "I would like to reiterate our thanks to ClaudioBravo, who had two successful years at the Club. I would like to add that, as we are meeting in the group stage of the Champions League, it would be a good time to offer him our recognition. The Club will thank him before the members and fans who come to the stadium on the day we face Manchester City." "We paid Ajax €13m with two more based on incentives subject to the results of the player and the team. The buyout clause has been set at €60m." "We would also like to officially confirm the loan of SergiSamper to Granada for coaching and sporting reasons. Granada will assume the totality of his salary. Granada will be penalised if he does not play." "We would also like to officially confirm that Douglas has been loaned to Sporting Gijon for one year. Barça will assume his salary but Sporting also will be penalised if Douglas does not play." "For MarlonSantos, his papers are in the process of being formalised. He left for Brazil after the season to formalize the documents he needed, but they still need two or three weeks and, officially, he cannot play until the papers are processed." "We discussed SergiSamper with LuisEnrique. It is best for the player to leave so he can get minutes and then he can return." "The priority is to get Douglas minutes because he's gone too long without playing. To make a real assessment of a player we need to see him on the field. It's a good transaction."